We are pleased to announce a very exciting giveaway in partnership with one the fastest growing hosting companies in the UK - Zyma.com. 10 Lucky BloggerTipAndTrick.net readers have the chance to win a FREE premium hosting account for a full year! Zyma’s customer base spans over 80 different countries and are well know for providing high quality and reliable unlimited web hosting to customers worldwide. Since inception, they are won several awards for their outstanding customer service to the hosting industry. Tweet this contest, like this: “Giveaway: 10 Free Web Hosting Accounts from Zyma.com http://bitly.com/UK7shY via @btipandtrick” then leave a comment below (with your valid email address) including your tweet link. We’ll pick 10 lucky readers and announce the results on Friday November 02, 2012. Note : Please enter your correct email address, because your zyma.com account registration email will send to that email address (if you are a winner). You are selected as the winner of this contest. As the winner you’ll get a FREE one whole year web hosting account (each!). Zyma’s staff will contact you with the information how to get the prize. hi, we need your tweet url, not twitter account url. how can i find the tweet link? Very excited to be a part of Zyma and BloggerTipAndTrick's free hosting account contest!! 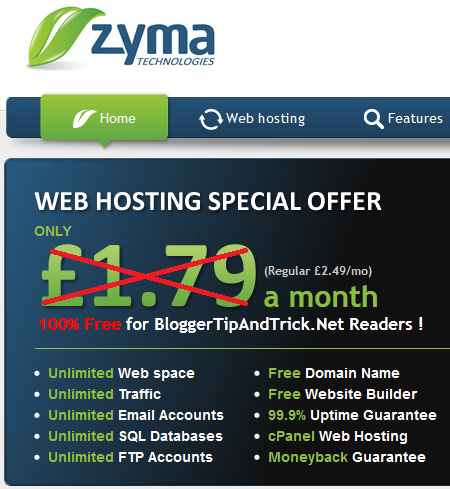 Zyma and BloggerTipAndTrick headlines this great contest which offers "FREE premium hosting account"! Hoping to win the prize.... It will be a great chance/opportunity to learn and build a more professional site with the free unlimited hosting. Thanks for the great opportunity. I am new to your blog and am really glad I bookmarked it. I have a plan, and deserve this prize! Good Luck Everyone! Giveaway: 10 Free Web Hosting Accounts from Zyma.com bitly.com/UK7shY via @btipandtrick I Deserve this because I have a plan! yes I won it...i'm really happy today...Thank u very much for organizing this great event... 😀 . Congratulations to the winners! I only wish I was one of them.